'Countdown to Savings' with Drum Corps International! 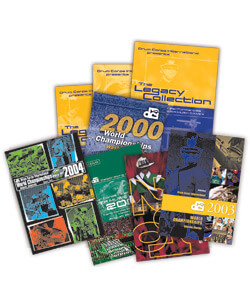 With the start of the 2008 DCI Summer Tour only two months away, get set for the summer season and "Countdown to Savings" with Drum Corps International through deep discounts on great DVD products. Don't miss out on these limited-time-only specials: Buy One, Get One Free: Any DVD part of the 26-volume Legacy Collection from 1974-1999. Order now! Buy Two, Get One Free: Division I World Championship Finals DVD sets from 2000-2006. Order now! $19 off: 2007 World Championship Div. I Finals DVD set. Now available for only $79. Order now! And don't forget, in addition to these great values, Drum Corps International's newest DVD "2008: The Countdown" is currently available for pre-order and will be shipping by the end of the week. Commemorating DCI's 2008 spring cinema event, it's the very first DCI DVD produced in wide-screen format. Pre-order now! Tick, Tock! Time's a-wasting! Offer good April 23 through May 2, 2008 ... so what are you waiting for? Order Today! Call 317.275.1212 or order online at store.DCI.org. Sale begins Wednesday, April 23, at 12 p.m. Eastern. Sale ends Friday, May 2, at 12 p.m. Eastern. Order confirmations DO NOT reflect discount pricing, but will be applied upon order processing within 48 hours. Offers cannot be combined with other promotions or discounts. Offers not valid on prior purchases. Drum Corps International reserves the right to modify or cancel promotion at any time.